Kenodoxia [vainglory, or literally “empty” glory] arises with comparison. The ‘eating of this apple’ is the moment that humanity begins to be clothed in a man-made identity constructed out of being better or worse than someone else in place of garments made of the uncreated energies of divine grace that uniquely fit each person. This is the moment humanity begins to be sustained by bread alone and the sweat of human labor, rather than “every Word that proceeds from the mouth of God” . As in Dostoevsky’s story of the Grand Inquisitor, humanity began to aspire for nothing more than a portion of daily bread, in place of the epiousian  of the Holy Eucharist that gives eternal life. Among the more salient and memorable observations of the respected and widely traveled former Swedish U.N. Secretary General, Dag Hammarskjöld, is that “humility is just as much the opposite of self-abasement as it is of self-exaltation. To be humble is not to make comparisons.”  This is something that not only evaded the proverbial Pharisee in Jesus’ parable, who by comparison considered himself far superior to the Publican beside him , but the Apostles as well, because this has been inherent to the human condition from the beginning. Apart from repentance, there is no cure. 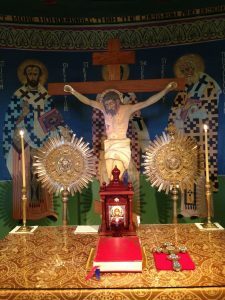 In the Gospels, we have the confessions of Jesus’s disciples, a treasured memory of the Church, though one that we often overlook to our own disadvantage. By identifying with the good disciples in comparison to the overweening prideful Pharisees, we show ourselves to be the same as the Pharisees by our very comparison! In other words, none of us need try and distinguish ourselves from humanity in which we are all made, but rather realize as Elder Arsenie points out, that “humility is genuine only when Christ is present.”  Thus we do well to cry out, Lord Jesus Christ have mercy on me a sinner! From the embrace of repentance arising from communion with Christ and all whom He loves, we find ourselves yet again naked…but no longer ashamed. The real and authentic life of each of us is “hid with Christ in God.”  God alone knows our true value which is derived from His own gifts. How then is it that awareness of our nakedness compared to the Creator and Only Lover of Humankind becomes a block to Communion rather than the very deepest possible thirst for it? Authenticity is precisely the humility of this very same nakedness that adorns Christ on the cross given into the hands of His creation. At that moment, by human reckoning, he is nothing by comparison with the great powers of the Sanhedrin and the Roman Empire. Jesus the Son of Man is shamed, humiliated and defeated as his mother and John the Apostle look on in grief. Lord save me from the vainglory of seeking an identity by comparison and the pride of trying to exceed my estimation of other people or to exercise power over them. Enable me instead to find my place among humanity in ordinary ways by being fully present wherever I am, whoever I am with, submitting to the Holy Spirit in all things for which I am responsible at any given moment. For we each have our unique calling and as Fr. Lev Gillet describes, the saints are those whose ordinary lives invisibly reveal that every ordinary thing is beyond compare. Mt. 6:11 This Greek word epiousian is not found anywhere else in the New Testament or Septuagint and suggests something more like “bread for our being” or “super substantial”. Origen and St Cyprian held that it referred to the Eucharist. Hammarskjöld, D. Markings, (trans. Leif Sjöberg and W.H. Auden), New York: Alfred Knopf, 1964, Ballantine Books, 1983, p. 75. Archimandrite Arsenie (Papacioc) “Eternity Hidden in the Moment” The Orthodox Word. (St. Herman of Alaska: California, 2011) No. 281, p. 289.